With recent contractions in offshore and commercial banking, for the first time in years accountants and finance experts, who have benefited from steady employment and healthy salaries, are witnessing a profession in profound transition. The current struggles are real, says Jasmine Davis (pictured), who in June 2015, became the first Bahamian woman to preside over the Institute of Chartered Accountants of the Caribbean (ICAC). Established in 1988, the Jamaica-based organization is the leading body advancing the interest of accountants regionally via its 3,700-strong network. “All disciplines and lines of business have felt the impact of the global recession,” says Davis, former president of the Bahamas Institute of Chartered Accountants (BICA). Even at the best of times, Davis finds that most micro, small and medium-size businesses do not avail themselves of an accountant’s services until they are forced to do so by financial issues, their bank, or some other financial institution. When the economy is under pressure, they are even less inclined. A certified public accountant (CPA), Davis gravitated towards statistics while enrolled at Florida International University. Believing her opportunities for “meaningful employment” would be limited as a statistician, she switched her major to accounting. Although every business requires some type of accounting/bookkeeping services, Davis found her niche as one of a handful of CPAs in the local healthcare and insurance industry. Fresh out of university with her bachelor’s degree, she accepted a job offer from PricewaterhouseCoopers to work in the firm’s Nassau office. When a mentor recommended her for a financial controller post at a leading healthcare facility on Grand Bahama, Davis got the job. 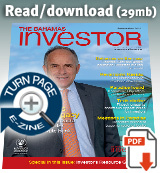 “The healthcare/insurance industry is unique and dynamic with endless learning opportunities. These are the attributes that I came to appreciate,” she says. In a multidiscipline, healthcare environment, there are many moving parts with internal and external stakeholders required to work as seamlessly as possible in providing quality healthcare to patients, all the while meeting all public expectations. “It is extremely difficult to project and establish a business cycle from year-to-year in the healthcare and insurance industry as it is so unpredictable and dependent on so many uncontrollable variables,” says Davis. Alongside her day job, Davis also chairs ICAC’s Regional Education/ Joint Seminar Committee and sits on ICAC’s Regional Tax and Monitoring Unit Committee, in addition to serving on the board of trustees for the Caribbean Court of Justice Trust Fund. Consequently, balancing her busy life is a constant challenge. “I try not to spread myself too thin so that I am able to make a meaningful contribution to the activities to which I have committed,” she says. 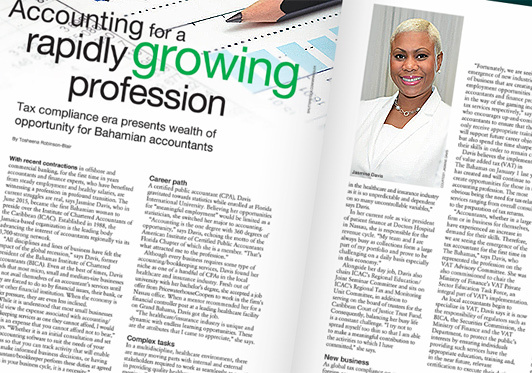 As global tax compliance on reporting foreign accounts continues to gather pace and international commercial banks slash their regional footprints, accounting professionals in The Bahamas are actually enjoying a wealth of opportunities. “Fortunately, we are seeing the emergence of new industries and lines of business that are creating new employment opportunities for accountants and finance professionals in the way of the gaming industry and tax services respectively,” says Davis, who encourages up-and-coming accountants to ensure that they not only receive appropriate training that will support future career objectives, but also spend the time sharpening their skills in order to remain current. Davis believes the implementation of value added tax (VAT) in The Bahamas on January 1 last year has created and will continue to create opportunities for those in the accounting profession. The most obvious being the need for tax-related services ranging from overall consulting to the preparation of tax returns. “Accountants, whether in a large firm or in business for themselves, have experienced an increase in demand for their skills. Therefore, we are seeing the emergence of the tax accountant for the first time in The Bahamas,” says Davis, who represented the profession on the VAT Advisory Committee. She was also commissioned to chair the Ministry of Finance’s VAT Private Sector Education Task Force, an integral part of VAT’s implementation. As local accountants begin to specialize in VAT, Davis says it is now the responsibility of regulators such as BICA, the Securities Commission, the Ministry of Finance and the VAT Department, to protect the public’s interests by ensuring individuals providing such services have the appropriate education, training and, in the near future, relevant certification to execute their duties. Regionally, Davis suggests the accounting profession is strong, but as with most disciplines there is “always room for growth.” The eight CARICOM countries that represent the territories which form ICAC recently participated in an initiative with the World Bank to produce the report Strengthening Financial Reporting Regimes & The Accountancy Profession in the Caribbean. Published on the World Bank’s website in August 2015, the report identifies a number of initiatives designed to assist in strengthening the profession in the region. Seemingly, the major priority for most territories is technical support. Pooling resources to provide a regional technical support help desk is one of ICAC’s strategic objectives. Davis’s vision for ICAC during her presidency is rooted in the organization’s strategic plan. As the recognized regional body for the accountancy profession by the International Federation of Accountants, ICAC, she says, will help to move discussions forward to support the adoption and implementation of the International Public Sector Accounting Standards that will serve to strengthen public sector financial reporting in the Caribbean. Davis is also placing renewed focus on ICAC’s membership expansion to include other territories so that membership will be more representative of the region. “We are collaborating with member bodies and our affiliates to launch financial literacy programmes throughout the region to ensure that education and awareness as it relates to financial planning is occurring at all levels,” she says.